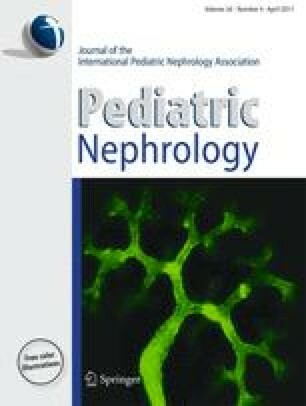 A 15-year-old male patient developed atypical hemolytic uremic syndrome (aHUS) at 16 months of age leading to end-stage renal disease. The family history was suggestive of autosomal dominant aHUS, and he was more recently found to have a C3 heterozygous gene mutation (1835C>T mutation in exon 14, which determines the amino-acidic substitution R570W) with no other complement abnormalities. He had two renal transplants, the first at 2.5 years, and the second at 8 years of age, but allograft dysfunction developed in both transplants leading to graft failure due to recurrent HUS at 5 years and 18 months post-transplantation respectively. At 15 years of age he received a third transplant from a deceased donor with pre-emptive plasmapheresis. He had immediate graft function and nadir serum creatinine was 1.3–1.4 mg/dl. Severe allograft dysfunction and hypertension developed 2 months after transplantation following influenza infection. Renal allograft biopsy showed thrombotic microangiopathy. He received plasmapheresis followed by eculizumab therapy. Allograft function returned to baseline 3 weeks after starting therapy, and post-treatment allograft biopsies showed improvement in thrombotic microangiopathy. He continues to receive eculizumab every 2 weeks with stable graft function 13 months after transplantation.